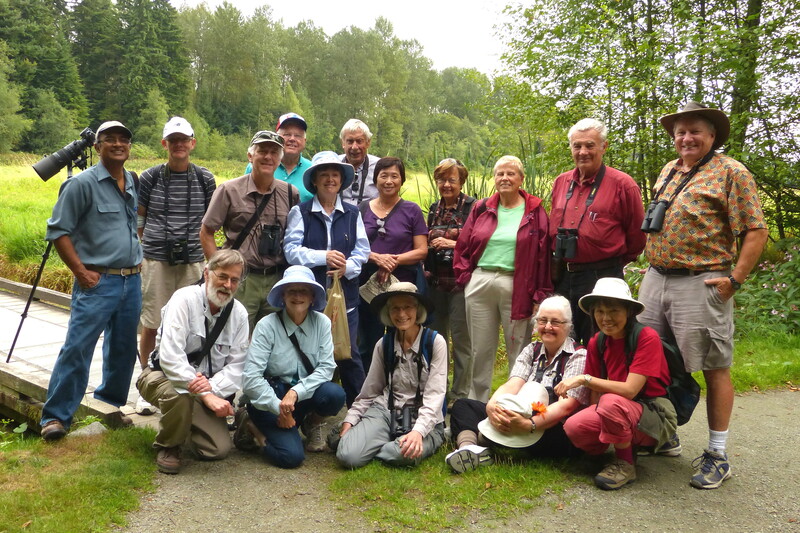 Sixteen DNCBers enjoyed a rare muggy Wednesday morning of birding at Deer Lake Park, a new destination for many of us. 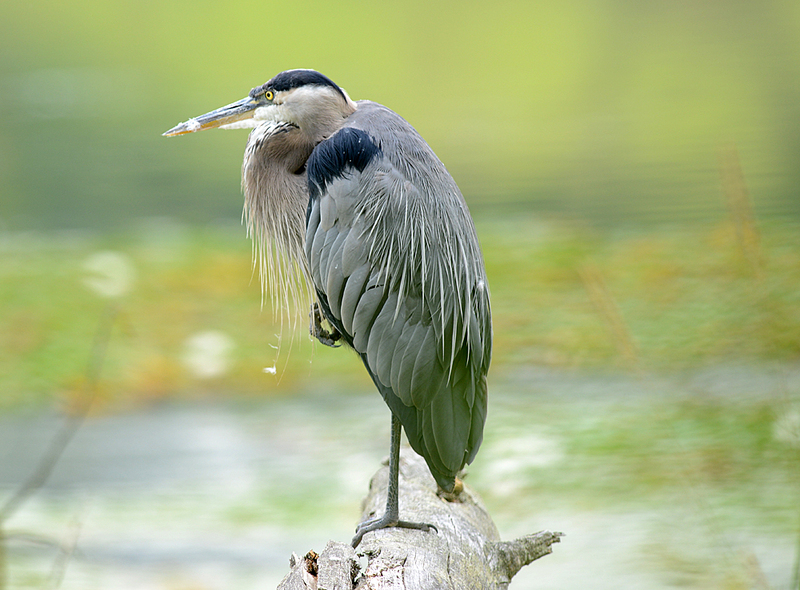 Incredible local naturalist, George Clulow led us on this brisk walk on well-kept trails and boardwalks through this beautiful City of Burnaby park. Being mid-summer there were no earth shattering sightings, but some hi-lites included: Western Wood-Pewee, Warbling Vireos, Orange-crowned and Yellow Warblers, native Douglas Squirrel, discovering unwanted Bass in the Lake, plus a plethora of George’s interesting tidbits of the history and background on the Park, in addition to his unbelievable identification skills, both sound and sight. Check out Marion’s, Tony’s (some scary headshots) and others’ photos on the DNCB Picasa site link. Eight of us car-pooled in three cars from Petra’s at 7:30 a.m. thankfully using the HOV lane. PB Lorna was a last-minute addition, and new driver Gerhard, after an “adventure” circling Burnaby, finally reached our Royal Road parking lot meeting place somewhat after our 8:30 a.m. scheduled time. The other DNCBers, including the suave, debonair and often-quoted newspaper naturalist, George Clulow, were patiently awaiting us. 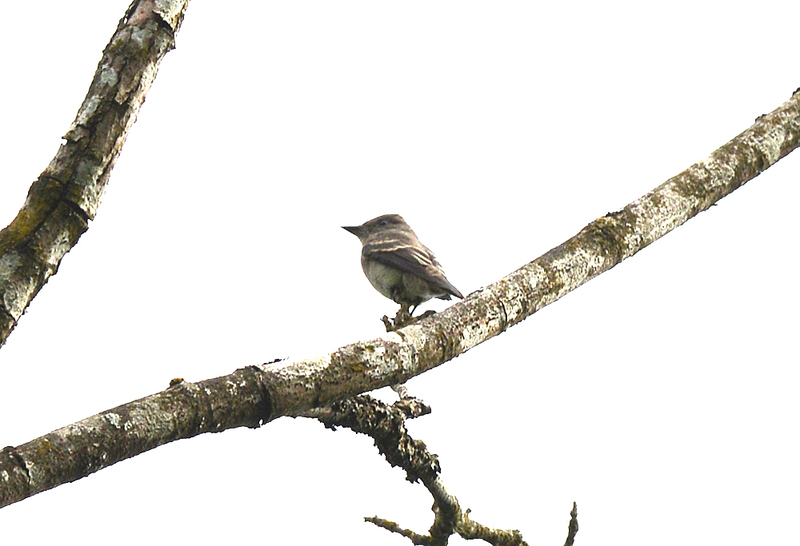 Warbling Vireos and other common stuff like House Finches and American Goldfinches. A couple of Purple Finches tested our ID skills; of course, George recognized the call. Both Black-capped and Chestnut-backed Chickadees were seen. 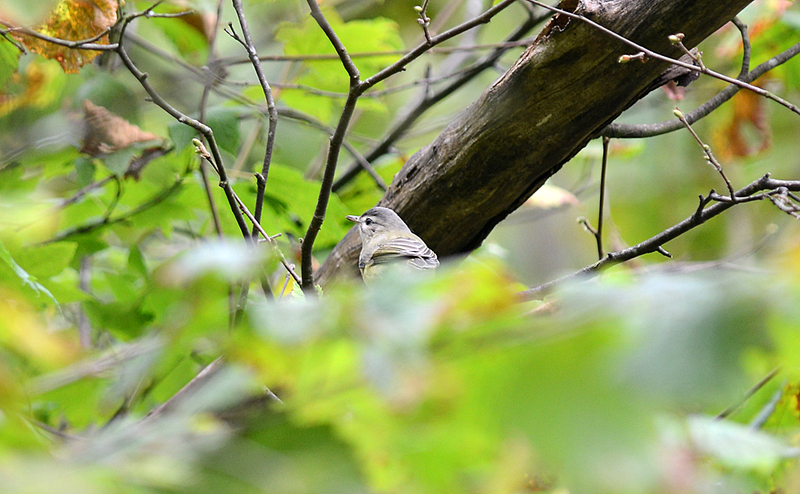 Some saw a Swainson’s Thrush as the many Robins of various ages and plumages were a bit confusing. While watching a Downy Woodpecker, a Pileated Woodpecker called, then two of them made a neat fly-past. We wandered back to the main Park area and through the meadow where a flock of Bushtits entertained us, especially White Rock Al. A conglomeration of photogs, Bryan, Marion and Marian, took our obligatory Group Photo before Mike took off to sell one of his several condos. Common Yellowthroats occasionally and quietly flitted in the Blackberry bushes. One dead tree seemed to be a meeting point for many species as we saw several Cedar Waxwings, Orange-crowned and Yellow Warblers and Goldfinches stopping and chasing each other. We left the trail to have a closer look at the Lake shore. 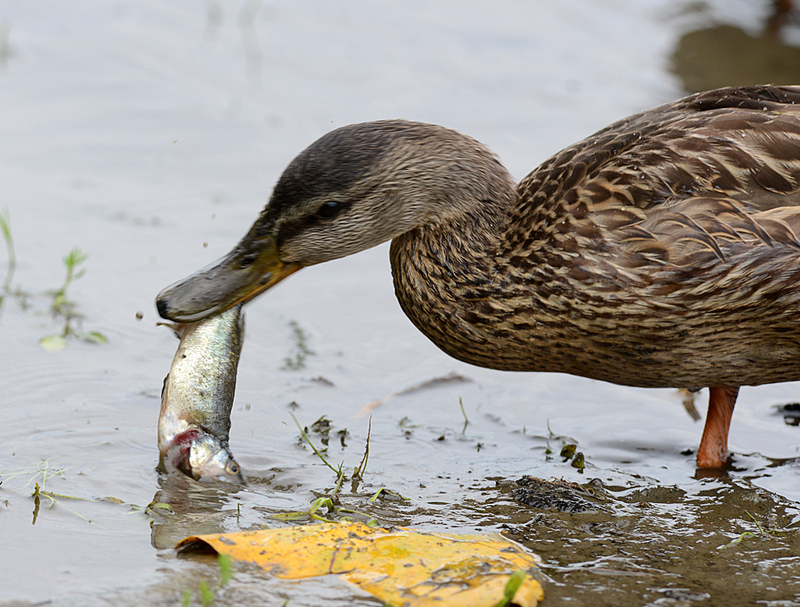 A fisherman was feeding small Large Mouth Bass he had caught to some Mallards. George had just finished explaining how Deer Lake had a successful year with many Salmon Fry seen there. Now learning that invasive Bass species (they will eat the salmon fry) were in the Lake, probably introduced by fishermen, George fears the end of the Salmon here. just before George showed us the new Heronry (about 6 years old) which had 17 nests this year. We got back to the parking lot around 12:30 p.m., a bit leg-weary but very satisfied. We thanked George for another awesome DNCB outing and then took a leisurely drive back to Tsawwassen (starving as too many others shared PB Lorna’s sandwiches, Louise’s meatballs and Marion’s cherries). Next Wednesday, August 21, we do our “away trip” to Manning Park, meeting at and leaving from the Ladner Bus Exchange at 6:30 a.m. See last week’s report for additional info, including about Annie Kaps offer to stay over at her Tulameen chalet. 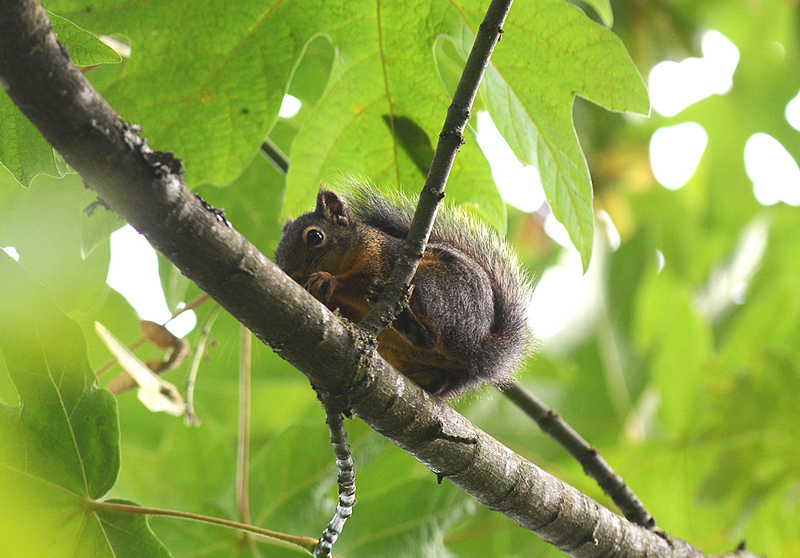 This entry was posted in *DNCB, Deer Lake, Douglas Squirrel. Bookmark the permalink.